Sacred Lily comes from the mineral-rich terrain of Wuyi region in Fujian province and it is one of those teas that might fool you easily. Beautiful gentle name and heavenly flower fragrance, make a striking contrast with dark wide leaves and rich and long lasting flavor. Heavy roasting gives unique flavor profile, but needs to be done masterfully to avoid the burn-out notes. 4 grams of loose leaf tea in 30ml of 95℃ water for 1 minute. Re-steep 4-6 times. This tea is pretty delicious. It might be the lemon tea of my dreams, actually. Amazing base choice (I��m in love with the rolled yunnan she uses! ), lovely soft lemon flavour, and vanilla to wrap it all up. Sometimes lemon teas can be a little harsh; that is not the case here. It truly does taste like a fresh lemon poppyseed muffin, and I can��t get enough. 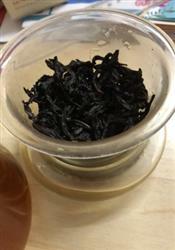 ��burnt�� tasting tea I��ve tried. This tea had a bit of a nutty flavor, followed up by a finish/aftertaste which was definitely burnt tasting, but came across to me as a burnt sugar sort of taste. 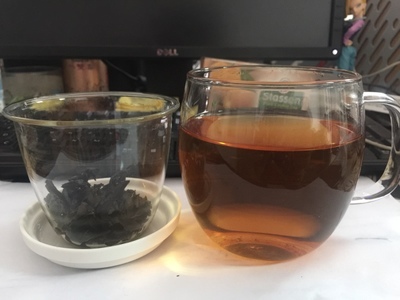 I can see why others might not have liked it, because it is really the most ��burnt�� tasting tea I��ve tried. weet, caramelly mineral roast with surprisingly fruity body. It gets thinner and a bit astringent as you brew it out, but not unpleasantly so. Flavors are balanced and elegant, my biggest complaint is that it dies a bit too quickly for my taste, around steep 5 or 6. Best/strongest steeps are the first two. I must have done something wrong, because it had almost no flavour when I brewed it up. Literally, did not taste like anything, and I gave it three minutes. Oh well. Better luck next time! A really interesting Oolong. Sweet and floral, with a mild sweet pepper taste to it. I was really kind of surprised by the sweet pepper taste � in a very good way. I really liked it. It brought a unique and very compelling element to the cup.